There are many great things about the films of Hayao Miyazaki. Just one of them is that if you happen to pause on seemingly any single frame, that image itself is a work of art. Artist Bill Mudron would probably agree. And, in fact, he takes the beauty of Miyazaki’s work a step further. 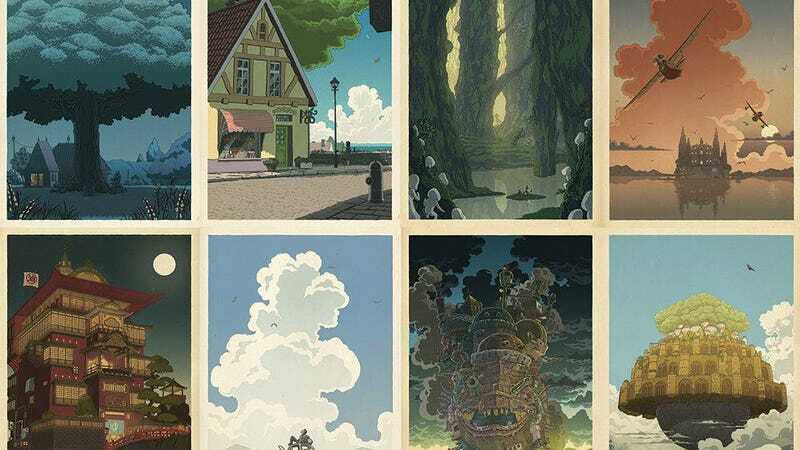 He’s done a series of posters inspired by Miyazaki’s films that capture quiet, peaceful moments from the worlds the master filmmaker creates. Here are just a few of those posters, including both reprints and brand-new works. Mudron did posters for 11 Miyazaki films, as well as a portrait of the director himself outside of Studio Ghibli, so what you see above is just a small selection of his work. Check them all out, and buy the set if you like, at this website.